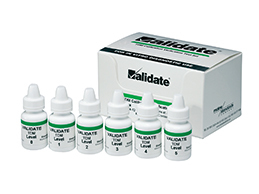 Our VALIDATE® ready-to-use test kits help you with the documentation of linearity and the verification of the entire technical assay range. Helping you ensure reliable patient diagnostic testing and fulfil accreditation requirements including ISO 15189, CAP and JCI. Our VALIDATE® kits are used for instrument and reagent install verification and also provide assistance when troubleshooting instrument systems, reagent and calibration problems. VALIDATE® comes with a long open bottle shelf life and can be used multiple times to troubleshoot with consistency. Multiple VALIDATE® configurations are available to meet the different needs of the many instrument systems from all major suppliers. The configurations are specifically formulated to maximize reportable ranges with minimum dilutions. 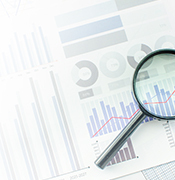 See the benefits VALIDATE® can bring to your clinical lab and a list of our instrument specific calibration & linearity verification kits in our flyers and catalogue.